One of those unhelpful forecasts suggesting rain with the threat of thunderstorms and lightning, none of which materialised. 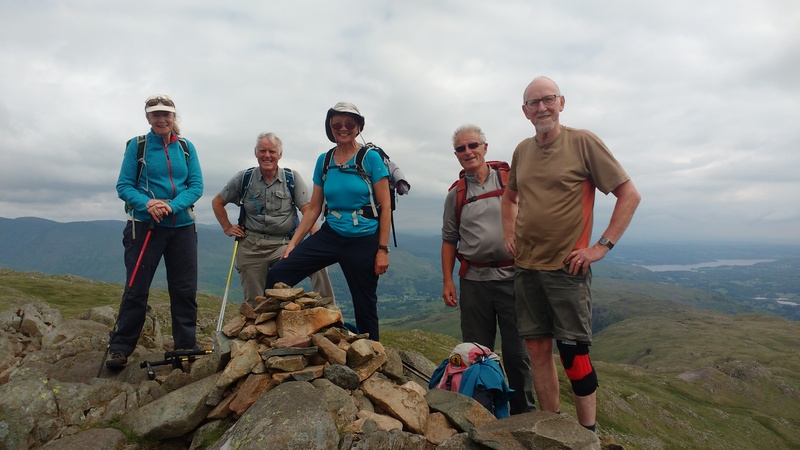 In fact, the five walkers ( Bob and Linda Heywood, Bev D’Arcy, Graham Moss and Richard Wright) who set off with me from Grasmere enjoyed a pleasantly warm but not too warm, day with a gentle breeze on the tops and a fair amount of sunshine. Tackling the steepest climb first, we made a steady ascent of Helm Crag from where we enjoyed splendid views of the valley below. After a brief coffee/juice/water break we continued along the long, undulating ridge over Gibson Knott to Calf Crag and a lunch stop in a sheltered hollow, again with great views of Helvellyn, Fairfield and the Langdale Pikes. After lunch, we made a short descent to the col at the head of Easedale then followed a faint path up towards Codale Head to reach the highest point of the day, Sergeant Man (2,414 ft), another terrific viewpoint for both the eastern Lake District tops and the central massif from Bowfell through Scafell Pike to Great Gable. After a few minutes regaining our breath and admiring the mountain panorama we descended via the frequently rough and in places scrambly, path down past Easedale Tarn and so to the green pastures of Easedale and back to our starting point. From there a short drive took us to the Traveller’s Rest and a well-earned opportunity to re-hydrate in the most satisfying fashion. Thanks to my companions for a very pleasant walk and to the Weather Gods who held off the rain until we were sitting in the pub.